On Long Nab 10+ Shore Larks remained in the 2nd field north of the Obs, by the Obs was a Wheatear and past there a Manx Shearwater, 2 Puffins, 42 Common Scoter, 16 Sandwich Terns, a 2cy Mediterranean Gull and 212 Common Gulls. Further south at Scalby Lodge the Stile Scrub held a Willow Warbler and a Blackcap. A new discovery today was a Pale-bellied Brent Goose on Star Carr scrape, the injured Dark-bellied Brent Goose was not surprisingly still on Burton Riggs and the ♂ Garganey successfully started its fourth week at Johnson’s Marsh with a Wigeon, 4 Teal, 2 Shelduck and a Common Snipe. 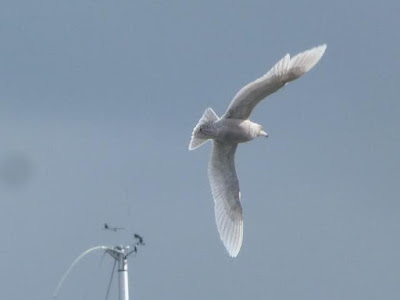 A 2cy Glaucous Gull was seen flying south past Scalby Mills at 13.05, it continued past Marine Drive and was noted going into the harbour having rested briefly on the roof of the Harbour View Café at 13.11. It remained here until 13.53 when the tourist Speedboat Rib flushed it from the middle of the inner harbour; it circled the harbour being harassed by the local Herring Gulls before heading off in a northerly direction.